In my last column, I discussed the “crusade” as a distinctive form of war – one qualitatively different from the forms of public war I described in my very first column. In my next few columns, I’m going to explore the way in which crusading manifested itself in the Holy Land. After that, I will look at the crusades in the Baltic region, in Iberia and against heterodox religious movements with Latin Christendom. The Crusades to the Holy Land were “wars of liberation” initially launched by the Church to restore Jerusalem to Christian rule. Following the First Crusade and the establishment of the crusader principalities (the County of Edessa, the Principality of Antioch, the County of Tripoli, and the Kingdom of Jerusalem – collectively known as Outremer), these expeditions were conducted primarily to defend the Holy Places against Muslim attempts at reconquest or, following its loss in 1187 and again in 1244, to recover Jerusalem for Latin Christendom. While authorized by, and fought on behalf of, the Church these wars were prosecuted by princes, nobles and knights from every corner of Latin Christendom as well as by so-called “para-crusaders” (milites ad terminum), and members of military orders such as the Templars and Hospitallers. They were fought primarily against a range of Muslim powers, although the Fourth Crusade ended up being waged largely against the Byzantine Empire, another Christian state. Although the idea of launching additional expeditions to liberate Jerusalem persisted for a considerable time, the Crusades to the Holy Land effectively came to an end with the fall of the last Christian stronghold in Palestine – Acre – in 1291. As Jonathan Riley-Smith has argued in his book The Crusades: A History, following the “birth” of the crusading movement and the First Crusade, the history of the crusades to the Holy Land can be organized into several discrete phases. The first of these, c. 1102-87, he describes as that of “crusading in adolescence”. During this phase, the Church and crusader principalities were forced decisively on to the defensive by an increasingly unified Islamic polity committed to the reconquest of Jerusalem and the extirpation of the Christian presence in Syria and Palestine. The success of the First Crusade was largely a function of disunity and internecine conflict in the Islamic world. This was also true of the period in which the Crusader States were established – disunity among the contiguous Muslim polities (Rum, Aleppo and Mosul, Damascus, Egypt, Seijar, Hama, Homs) meant that the Christian princes could play them off against one another to great strategic effect. Almost immediately after the liberation of Jerusalem, however, Muslim opposition began to coalesce: Egyptian forces, for example, attempted to retake Jerusalem as early as 1099, as did those of the sultanate of Iraq beginning in 1110. Ominously from the Church’s perspective, an increasingly unified Muslim state centered on Mosul and Aleppo began to coalesce in the 1120s. When a new governor, ‘Imad as-Din Zengi, was appointed in 1128, he led this newly unified emirate on a series of campaigns intended to further extend what had become his personal domain at the expense of both his Christian and Muslim neighbours. When in 1144 the count of Edessa entered into a defensive alliance with one of Zengi’s Muslim adversaries, Zengi sensed an opportunity and attacked the county. Edessa, the capital of the first crusader principality and a cornerstone of the strategic defenses of Jerusalem, fell to Zengi’s forces on Christmas 1144. 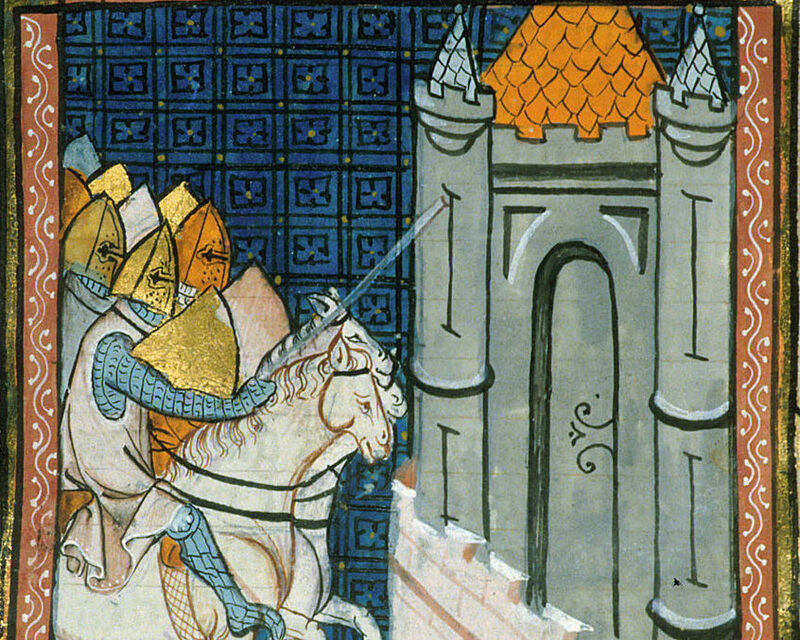 Almost as soon as they had taken Jerusalem in 1099, the crusader leadership realized that if the Holy Land were to be made secure it would be necessary to create a kind of defensive buffer around Jerusalem. In addition to an “inner ring” formed by the principalities founded during the First Crusade, this would also require an “outer ring” comprising the key strategic towns of Ascalon, Aleppo, Damascus and the Mediterranean ports, all of which could provide staging areas for any future Muslim counteroffensive against the Kingdom of Jerusalem. With the fall of Edessa, this strategy was seriously compromised. On 1 December 1145 Pope Eugenius III reacted to this unwelcome development by issuing a general letter entitled Quantum praedecessores, which called for a second crusade to fight in defence of the Holy Land. Following a poor initial response, the encyclical was reissued on 1 March 1146 and Abbot Bernard of Clairvaux was charged with preaching the crusade in France and Germany. Quantum praedecessores was augmented by a second encyclical issued in October of that year – Divini dispensatione – addressed specifically to the Italian clergy. In addition to calling on the armed laity to take the cross and come to the aid of their besieged brethren in Outremer, both of these letters offered those who took the cross remission of sins, protection of property and other privileges. The former also outlined the motives behind this call to crusade: on the one hand, the need to right the injustices perpetrated by the Muslims (the unlawful seizure of one of the oldest of all Christian cities; the spoliation of the local Church and its relics; and the murder of the local archbishop and his clergy); and, on the other, the need to deal with the threat to the Church and all Christendom posed by the loss of the city. The latter extended the crusade to Iberia and the Baltic frontier, in effect authorizing a three-front campaign to defend and expand Latin Christendom. Guillaume de Tyr, Histoire d’Outremer, XIVe siècle, Paris, BnF, département des Manuscrits, Français 22495 fol. 154v. The response to the call was an extraordinary mobilization of the armed laity of the Latin world. In 1147, two massive armies – one under the leadership of King Louis VII of France; the other under Conrad III of Germany – embarked in quick succession on the overland route through Byzantine Greece and Anatolia to Syria. Despite the tremendous enthusiasm generated by the venture, however, the sad reality (from the Church’s perspective) was that these crusader armies were simply not up to the task of taking on the Muslims threatening Outremer. Against the backdrop of political maneuvering amongst the French, German and Byzantine leaders, the Seljuk Turks inflicted crushing defeats on Conrad’s army at Dorylaeum and Louis’ army at Laodicea, both in Asia Minor. Despite the clear danger posed by the unification of Egypt and Syria under Saladin in 1174, the resulting demoralization and disillusionment mooted the possibility of a major crusade to the East for the better part of a generation.